Last year two PhD students, Annie Quandt and Georgiana Avram, from UoN’s Horizon Centre for Doctoral Training organised an event about women in the digital economy. One of the speakers they invited was the inspirational Dr Sue Black. She was named one of the Guardian’s top-50 women in tech, and was awarded an OBE for Saving Bletchley Park. From Sue we learnt about #techmums, the social enterprise she founded, which aims to improve women’s digital skills and boost their confidence. She targets mums in order to help them educate their families, return to work after career breaks and start their own businesses. After Sue’s talk, with encouragement from Professor Sarah Sharples, a group of Horizon research staff and students set about trying to make #techmums happen for the first time in Nottingham. It’s a six week training course provided by schools and community organisations, and through our local contacts we spread the word about what #techmums has to offer. 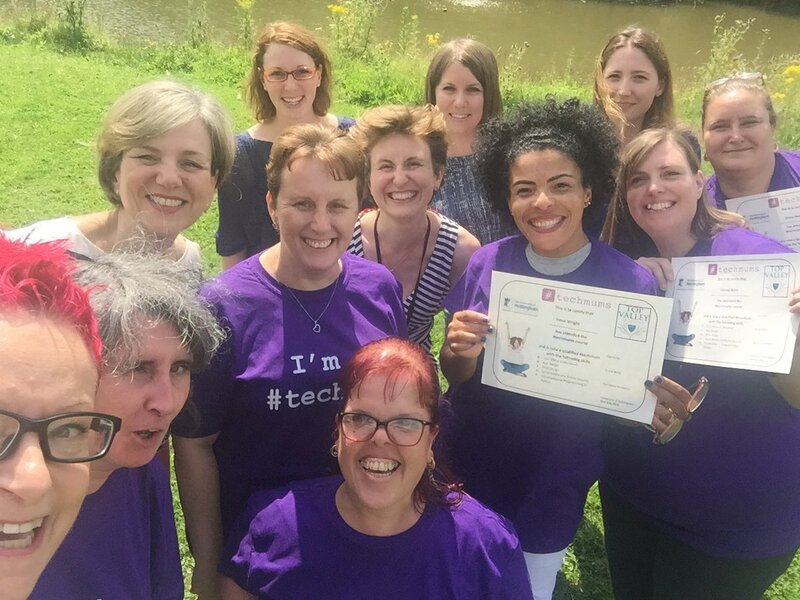 With enthusiasm growing but funding tight, the School of Computer Science offered to finance a pilot #techmums course in Nottingham. They understood and valued Sue’s vision as a way to tackle gender stereotypes about using computers. And helping launch this in Nottingham demonstrates their commitment to supporting the local community. With lots of support from Deputy Head Teacher, Tracey Meeks, the Nottingham pilot was hosted by Top Valley Academy in July. For three weeks, Sue and Julie McCarthy, another experienced #techmums trainer, left London at the crack of dawn so they could deliver two intensive training sessions in one day. Each #techmums session tackles a different subject: cloud computing, app design, social media and security, web design and Python programming. The trainers provide lots of practical support and encouragement to try new things, and use social media channels to maintain a community outside the sessions. Volunteers from UoN also attended sessions to witness #techmums in action, for personal development, and to learn from the skillful trainers and supplement their infectious passion. The final session of the #techmums course was a graduation event, which provided a brilliant opportunity to bring the mums from Top Valley to Jubilee Campus. Lunch was laid on in the Computer Science atrium, with celebratory fizz for the graduands. After that the #techmums tried out a VR installation, got words of encouragement from technical skills developer, Kelly-Ann Vere, and were awarded certificates by Lilian Greenwood, Labour MP for Nottingham South. The #techmums Nottingham pilot was a really positive shared experience, as Georgiana has documented. It also provided an opportunity for Sue to be interviewed for the Computerphile YouTube channel, with its three quarters of a million subscribers. And a documentary video about the first Nottingham #techmums will soon be ready for release too. But best of all, we’ve heard from the Top Valley that they’ve independently secured a charitable grant to deliver another round of training for a new group of mums; meaning we’ve achieved our original goal of getting #techmums established in our local community. To find out more please contact Dr Sarah Martindale.